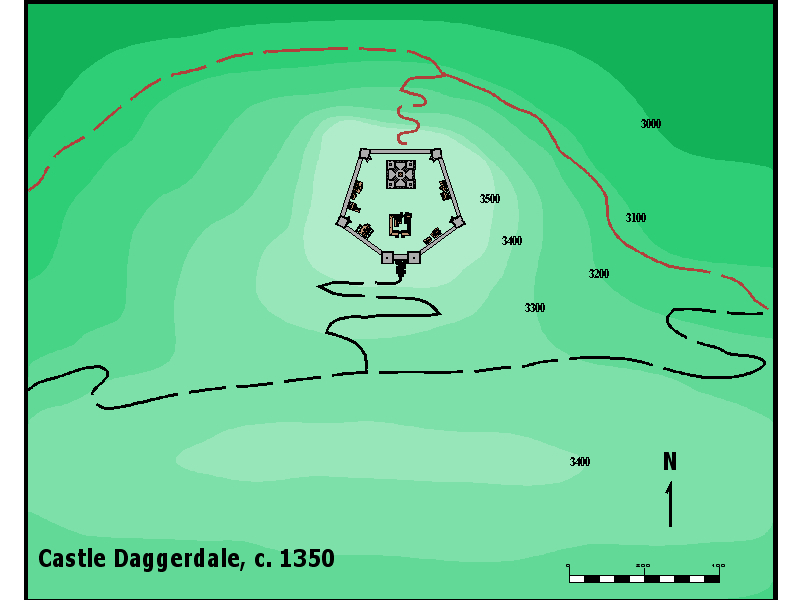 I was wondering if anyone knows of, or perhaps has made up a floorplan for the ruins of Castle Daggerdale, circa 1369. To the best of my knowledge, Castle Daggerdale is a complete ruin at the time of SotD. I was not expecting the PCs to be put up in style I too had understood that it was gutted by fire and structurally damaged in 1353, when Randal Morn defeated Malyk. But I also understood that Morn's Freedom Fighters still used it from time to time as a base of operations. As such, the PCs could camp there and possibly get out of the rain; and possibly be attacked by creatures that might inhabit the ruins . In any case, how do you envision the layout of the Castle? Unfortunately, the map itself isn't still stored on the site. You could try contacting the site owner though. I think Christof is still around. He also did the map for Castle Dunbarton on my website. The castle sat atop a ridge that divides the Ashaba from a tributary stream to the west. Coming up from the Ashaba valley, there's an old road that meanders through a series of switchbacks. The road is no longer maintained, so it's very rocky, partially washed out, and little better than a trail now. It continues over the ridge, crosses the stream and connects to the Tethyamar Trail. A cart track at the top of the ridge climbs a promonotory to the north where the castle sits backed up against a steep drop off. The castle itself was just a stone keep with an outer wall enclosing a small bailey that contained a few wooden outbuildings. The outer wall was roughly pentagonal with the keep against one wall, a tower in each angle, and a gatehouse that cut off the point opposite the keep. There's nothing left of the keep except the foundation, and the outbuildings are just a few rotted posts. Of the wall, all that's left is about half the west tower of the gatehouse, and perhaps a third of the wall going back to the west tower. Beneath where the keep stood, the storage cellars remain intact. A secret tunnel from the cellars goes down about 500 ft to a hidden trail north of the castle that leads east or west back to the old road. During the days of the resistance, the Freedom riders made use of the castle site as a refuge with a good vantage of the surrounding country. The cellars provided storage for food supplies, and the tunnel made a good escape route in case of attack by superior numbers. It wouldn't be difficult to construct a map from that. If you get ahold of Christof, I would like to see his map. Thanks for the great description, Erskine. That was very helpful. I also found this, which may be Christof's old map. Not sure. I find this map confusing, unless the top of the map is south (I can't read the compass). 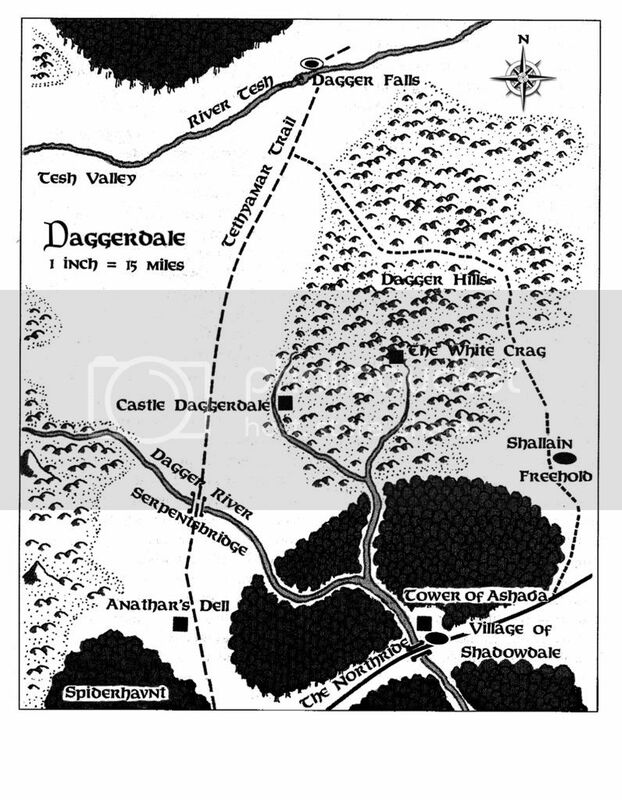 The Canon maps I have (Dalelands, Volo's guide to the Dalelands) Show the Ashaba River running north from Shadowdale into the Dagger Hills to White Crag. A short way into the hills, the Cold Rush river branches off to the west and flows northwest some 15 miles to pass by the west side of Castle Daggerdale. What is the stream in the above map flowing to the right (east?-west?) from "Castle Daggerdale"? Exact positioning aside, I like the idea of the Castle on a promontory overlooking the lands to the west. The photo image link provided is nice as well. I almost added that I would leave out the stream. I don't really know what it's doing there. As you point out, it can't be the Ashaba or the Cold Rush. I thought perhaps the person just intended it as a small creek that feeds into the Ashaba. It's not impossible for a creek to be that high up in the hills, I suppose, but it would be small and very fast flowing. It might only flow during the spring runoff, or after a rain. Do you draw maps, Afet? If you draw one of the castle for your game, I would love to have it for the Daggerdale Project. Till now I haven't. But I may start. I don't have any dedicated software, like Campaign Cartographer. On another note, I imagine a now little used trail running southeast from Castle Daggerdale along the Cold Rush River to the Ashaba. From there, the trail splits and runs south to Shadowdale and east to the Shallain Freehold. Since the abandonment of Castle Daggerdale as the seat of power and commerce, this trail has fallen into disuse. However, if I remember correctly, Zhent forces to attacked Shadowdale along a trail from the north during the Battle of Shadowdale in 1358. It makes sense that the Zhent forces would have come south along the Tethyamar Trail, then turned southeast from Castle Daggerdale. Hence, the trail would have been fully cleared as recently as ten years ago to allow for an army to pass. I'm still just using CC2, but I might be able to draw up something that will work for you. Maybe I'll pick up a copy of CC2 or 3 and have a go myself. I've seen maps done with CC3, and they are light years ahead. If you draw one up, let me know. I'm messing around with one now, but I'm not sure it'll be what you want. I'll pass it along when I'm done. This is more of a site plan than a floor plan. It's just a rough sketch of how I imagine the place would look. I picture the terrain as rocky, but overgrown also. The area right around the castle would have been cleared when it was in use, but after sixteen years it would have a lot of new growth. This looks similar to what I pictured, except that I would rotate the image clockwise 90 degrees, so that the gate house faces west and the the road runs north south. I would leave more of the wall foundations intact. It is no small thing to completely destroy a Castle after all, and there is no canon evidence that Morn's highly mobile Freedom Fighters ever used siege machines. Also, sixteen years is not much time for erosion to have had a significant impact. I agree that it would be heavily overgrown with bushes and young trees, though. Near the headwaters of the Ashaba lie the ruins of Castle Daggerdale, once the seat of the Morn family. The castle is still intact, but large sections have been gutted by fire. So yeah, more of the place should still be there. I would guess that the outer wall is mostly intact, the keep is gutted, and the outbuildings are burned to the ground. Why do you think the road should run north-south, though? Edit: Here's what I drew for the castle to guide me in creating the ruins. If the castle is mostly intact, then most of this would still be there. Fantastic. The new image looks great. 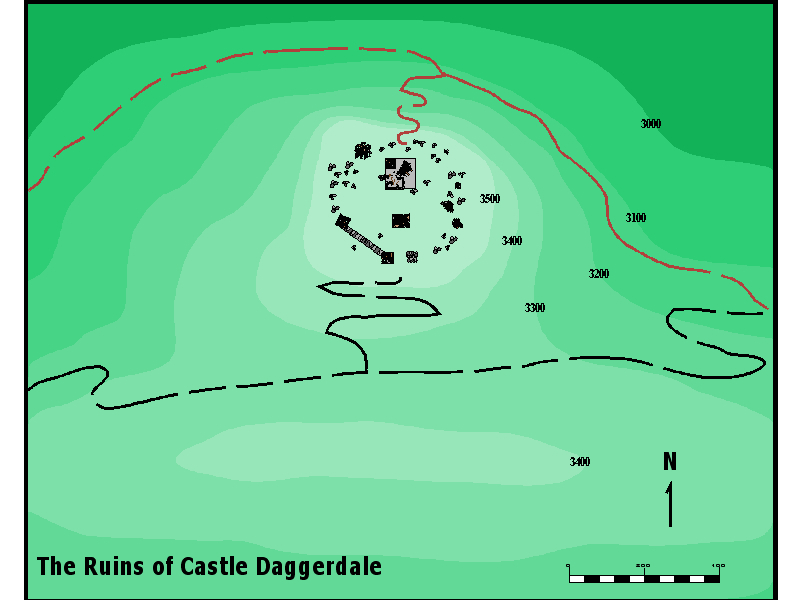 Regarding the orientation of the road, During the heyday of the Castle Daggerdale, there were no major settlements in the Dagger Hills, so I see no need for a road to have run directly west into the Hills from the Castle, except perhaps for routine patrols and reconnaissance, in which case a horse trail would have done the trick. This trail would still be used by Morn's Freedom Fighters. On the other hand, it makes sense that there would have been regular trade traffic between Castle Daggerdale and both Shallain Freehold and Shadowdale (both to the southeast). I picture the Castle bridge (across the Cold Rush), to be a short way to the northwest of Castle Daggerdale. Therefore, I would run the road south from the bridge, past the west side of Castle Daggerdale, then southeast along the Cold Rush to where it empties into the Ashaba River, at which point where there would have been a wooden bridge or a ford. I favor a wooden bridge at that point because there are plenty of trees nearby, and because the Ashaba river would be running quickly out the Dagger Hills, cutting a deep ravine. As I mentioned before, IMC it was this route that Zhent forces used to attack Shadowdale from the north in 1358. I see. I was using the NJ map as my guide. It's very close to what you're describing, but there's a jog in the trail that has it going east-west past the castle. The bridge is due west of the castle on that map, and although the path goes south for a short ways, it turns back north and then east. I'm not sure why it was drawn that way, unless it was to show the roughness of the terrain in the hills, where the shortest distance between two points is not always a straight line. That's where I got the picture of the trail climbing a north-south ridge that divides the watersheds for the two streams. Aha, now I see what you're talking about. I still think, however, that it makes no sense to forge a road east up into a difficult, hilly, mostly unpopulated area that offers nothing but rocky, scrub-covered hills and ancient ruins. As far as just passing eastward through the Hills is concerned, there's simply nothing on the eastern side of the hills to justify the effort. Neither is it logical to use the Hills to go north, since the Tethymar trail is right there. It makes more sense for any road going east to take an easier and more direct route along a river valley toward two other major settlements. By the way, while we're on the SotD topic, I have a few nagging questions about the trilogy that perhaps you could offer an opinion on. 1. Where exactly do you think Ariton goes after going to request Lhaeo's help in Shadowdale? He presumably went to muster the Freedom Fighters, since he appears in the last module. Which leads me to my next question. 2. How does one explain why Ariton and the Freedom Fighters do not seek out Morn themselves? Presumably Ariton could have mustered up to 200 Freedom Fighters and mounted a recovery effort of his own. I agree. Honestly, it doesn't make a huge amount of sense to have located the castle itself in such a remote region. It's a good location for an outpost, perhaps, but not the seat of power. Given that it's there, though, would people want to travel east from it? I agree that the easier route is to continue south down along the Cold Rush, and have a bridge over the Ashaba just above where they merge. Let's say there is such a route. I think it's reasonable, though, that there might be an alternative route east that crosses the Ashaba higher up in the hills where it can be easily forded. It would be, as you suggested, a horse trail, but perhaps it's a more concealed route, and more popular with the Freedom Riders in 1369 than the direct route along the Cold Rush. I suspect also that the bridge over the Ashaba would have been targeted for destruction by the Zhents after their failed invasion of Shadowdale. It provides a too convenient link between Randal and his supporters in Shadowdale. Absolutely. I'm full of... opinions. That's a good question. I thought it was problematic that he ran away from the fight when Randal was taken. Your suggestion is the best option. The module does provide for random encounters with the Freedom Riders. I would insert a planned one while the PCs are traveling to Shraevyn's Tomb, and have the leader of the Freedom Riders patrol reveal that they are scouring the countryside for clues to Randal's whereabouts. You could prepare for that ahead of time by having Lhaeo provide the PCs with a password in case they run into Freedom Riders. I would say that they are looking for him, but it's like trying to find a needle in a haystack. The second module suggests that the PCs spend some time futilely hunting for Randal before being directed to his location by Hedestin. You could have them already coordinating their efforts with the Freedom Riders, and Ariton or Mestin could direct them south to Spiderhaunt where they receive their vision from Hedestin. I think that would provide a natural explanation for what the Freedom Riders are doing during that time, why the PCs get to Randal first, and Ariton's willingness in the third module to trust the PCs with the mission to Dagger Falls. Ah! Fantastic. I'll have to add a link to that page on my site. I note he has a link to the Daggerdale Project, but it goes to the old Freeservers site, which has been defunct for a long time now. Could you email him this link, and ask him to update it? If I'm not mistaken, he also used to have reviews of the SotD modules on his site that were written by Eric Boyd. I wonder where those went to. 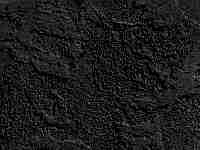 There's information on the terrain of southern Daggerdale in Cloak of Shadows. I remember that I loved reading the encounter with Randal Morn and his men (who aren't really called Freedom Riders, or Freedom Fighters as you have it -- that was one of Jim Butler's sillinesses). What's this Cold Rush River? Who wrote Cloak of Shadows? I'm afraid I'm not sure about the "canonicity" of the name of the Cold Rush. However, the map in "Volo's Guide to the Dalelands" shows a river running south along the western edge of the Dagger Hills, past Castle Daggerdale and then southeast along the southern edge of the hills to meet up with the Ashaba River, which flows south from The Whiteout Crag in the heart of the Dagger hills. Who wrote Cloak of Shadows? Ed. It's part of the Shadow of the Avatars trilogy, book II. I haven't read it. I'm afraid I'm not sure about the "canonicity" of the name of the Cold Rush. I'm 95% certain that it's an invention of the Northern Journeys project group. However, the map in "Volo's Guide to the Dalelands" shows a river running south along the western edge of the Dagger Hills, past Castle Daggerdale and then southeast along the southern edge of the hills to meet up with the Ashaba River, which flows south from The Whiteout Crag in the heart of the Dagger hills. It's The Dalelands map that shows that. The Volo's Guide has it flowing out of the Dagger Hills, same as the FRCS(2e).